Chile is an amazing country with some of the most diverse terrain and climates on the planet. It contains both the wettest and the driest place on Earth, made up largely of mountains but also containing areas of desert, rainforest and scrubland. Here’s how you can explore Chile from south to north. At the southernmost tip of Chile, you’ll find Ushuaia – the most southern city on the planet. It’s often referred to as ‘the end of the world’ and is set to a backdrop snowcapped mountains. You can explore the port, take a trip through the mountains and learn about the history of this isolated but buzzing settlement. Of all the glaciers in Patagonia, Amalia Glacier might just be the most impressive. The wall of ice is absolutely vast – from a distance, it looks like a frozen tidal wave making its way through the river. The likes of Paragon Expeditions offer boat tours of this glacier. Torres Del Paine national park is a popular spot for hiking, renowned for its jagged mountains and crystal-clear lakes. There are several treks, which you can take a guided tour of – or explore yourself if you’re feeling brave. There are several places in Chile where you can spot penguins. Chiloe Island is one of the most accessible spots for seeing penguins. Two varieties live here – Humboldt penguins and Magellanic penguins – and they both breed together. The rural landscape of this island and flowing meadows are also worth visiting for. Villarica is located in the Valdivian temperate rainforest and is home to one of Chile’s most active volcanoes. There are organised hikes up this volcano for anyone daring enough. It’s also worth taking a tour of the nearby rainforests where you may have the opportunity to spot exotic wildlife such as pumas and chillas. Chile’s capital city Santiago contains most of the country’s population and is a vast and vibrant place. Here, you can take a break from the rural hiking and enjoy the city’s many restaurants and markets. Located right in the hub, you’ll find luxury accommodation such as Renaissance Santiago Hotel to stay at. You can also explore the city’s history by visiting landmarks such as San Cristobal Hill, as well as a number of museums. In the north of Chile, you’ll find the magical Atacama desert – one of Chile’s most popular attractions. The landscape of this desert can feel as if you’re exploring another planet with its red mountains and still lakes. You can watch the sunset over Moon Valley and gaze at the bright stars at night. There are many tours through the desert organised by companies such as Rainbow Tours, which can allow you to find the best viewpoints and most impressive natural sights. We do a lot of adventuring on the blog, but the broader subject is that we love to travel, even if it’s to a new city! Here’s an example of a place on our bucket list, combined with some money saving travel tips! Follow these simple secrets, and it’s a place you can cross off your list without breaking the bank! Kuala Lumpur is the capital of Malaysia and is bustling with amazing sights, shops, and history. Millions of people visit there every year to travel around the city and also explore the jungle which is only an hour away! However, it can be expensive in Malaysia, so you need to keep the costs down. Here are some ways to save money when visiting Kuala Lumpur (or KL to the locals) on a budget. One of the top things you should do if you want to save money when visiting Kuala Lumpur is download or buy some guide books before you go. You need to be able to plan the trip before you go so that you can save some money. If you turn up and are unsure of where you are going, you could end up wasting money that you don’t need to. Therefore, plan your route with your guide books and then you won’t have to spend money on tour guides to show you the best sights. Another way you can save money if you are visiting Kuala Lumpur on a budget is by booking your hotel early. When you decide you are going to be travelling to the city, you need to start looking for the best deals on hotels. Don’t leave it till the last minute as the costs will rise and it will be expensive to get the best award-winning hotel rooms in KL, Malaysia. Go on compare sites so you can check who is doing the best deal on rooms. You can also save money when visiting Kuala Lumpur on a budget by using public transport to get around. As this article says, the subways and bus systems are so easy to use, and English is most spoken here, so if you are stuck, you can easily ask for help. If you use public transport, you don’t have to pay out to go on pricey tours around the area. Another way to save money when you are visiting Kuala Lumpur on a budget is by trying the street food. You need to try and not be afraid and have a go at eating the tasty delights as it will save you cash. Malaysian food is delicious, and you will find many stalls selling dishes such as Nasi campur. This is rice covered with either fish, vegetables or curry. It will only cost you around 4 – 8 RM so it won’t break the bank. You can also save money when visiting Kuala Lumpur on a budget by booking your flights to stop in Dubai on the way. A direct flight takes around 14 hours and can be very expensive. Therefore, why not stop on the way in Dubai as it’s cheaper and can mean you could explore the city. Stay there for a day or two so you can see the highlights, and then you can catch the flight on to Kuala Lumpur. Hopefully, these tips will help you to have a great time in Kuala Lumpur without putting you in debt! Let us know any tips you have, and your experiences in this wonderful city in the comments section below! It was a bit of a shock to the system carrying the kayak from the car to the sea, and then standing in the freezing cold British water, but it certainly woke me up. Once I was on board and paddling out to sea, my heart rate increasing meant my sniffles had gone, my headache was dulled, and I could breathe again! I felt refreshed and full of energy! I paddled long and hard, forgetting at times that just a few hours before, I was feeling sorry for myself in bed, wafting olbas oil around the room. What an amazing cure! OK It’s not quite a magic carpet, I’ll give you that – but being on the water means you’ll find hidden areas you’ve never seen before. We dipped in and out of beautiful caves, saw an old shipwreck, found our own private beaches inaccessible by land, and saw wildlife I’d never witnessed before, in the shape of birds and fish who won’t (or can’t) come anywhere near your office in the week! You’ll also have a new perspective on things – areas you thought you knew will be seen in a new way! You’re essentially sitting on the water! It’s beautiful! IT’s a shame I don’t have a waterproof camera! One you get into the habit of paddling yourself along, you soon pick up a rhythm, and you glide through the water effortlessly. After a while, you may start to ache, but you’re never too tired to carry on. I guess that’s the beauty of being sat down the whole time! depending on how upright you sit, you’ll work different muscles in your shoulders and chest, and even in your stomach as you twist your core to paddle on each side. You can also adjust your grip and paddle in a different way to work on new muscles on your arms! You’ll be constantly working out and hardly notice…. But when the wind picks up and you need to paddle against it – that’s when the hard work is needed! paddling against the wind is the most tiring part of kayaking, but if you get your technique right, you’ll be out of the wind in no time, and you’ll have a fantastic body by the end of the summer! You’ll be constantly working out and hardly notice…. But when the wind picks up and you need to paddle against it – that’s when the hard work is needed! paddling against the wind is the most tiring part of kayaking, but if you get your technique right, you’ll be out of the wind in no time, and you’ll have a fantastic body by the end of the summer! Now this last reason may not be for everyone, but many people choose to go fishing whilst they’re out on the water! You can get a casual hand line and try your luck, or you can go the whole hog and get a fish detector and bring your reels! There’s nothing like some fresh mackerel for dinner, and it tastes so much better when you catch it yourself! Is there anything else you love about kayaking that we’ve missed? Let us know in the comments below! The great outdoors is one of the great treasures this country has to offer. There is such a range of climate, geography, and landscape. But, you don’t have to stay here, of course, to enjoy the wilds. If you’re a bit of a jet setter you might decide you want to head off to a different country to go on an outdoor backpacking adventure. Whatever you choose it’s pretty clear that something like backpacking has a broad appeal. This is because it gives us a more stripped back experience, and allows us to be at one with nature. Anyone who has the travel bug and enjoys being outdoors will get a lot out of a backpacking trip. But, you need to know and plan for what to expect so you can take steps to have the best possible time. First things first, you need to make sure you have the right supplies for backpacking. There are plenty of things you’re going to need for your outdoor adventures. And it’s important to make sure you have everything you need. Don’t forget that most of the time you’re going to be out in the middle of nowhere. So you have to have important supplies with you. You’ll need a first aid kit in case of any minor injuries. Your own tent wouldn’t go amiss either unless you plan on paying for hostels the whole time. It’s important to have a large and sturdy backpack and to make sure you carry a map and compass safely. Bringing the right supplies is essential for having a great adventure. You need to make sure you know exactly where you’re going. And the way to do this is to make sure you map your route out. You have to get a map and figure out the route you’re going to take. It’s vital you know where you’re going so you don’t get lost. This way you’ll also be able to figure out the most efficient and safe route. Make a decision about the sort of backpacking you want to do, such as desert hiking, and then look up the best possible routes to take. You need to map everything out in detail before returning you set out on your journey. It’s important to remember that these kinds of trips and adventures can sometimes be quite intense. And that’s why you need to make sure you don’t try to go it alone. Make sure you always have a buddy or friend with you. This is important for safety and security, and will help you complete tasks much more quickly. You’ll also be able to help and encourage each other if you start to struggle. The best thing to do is approach a friend who is a bit outdoorsy like you, and see if they want to join you. Planning the ultimate backpacking adventure is important to make sure you have a great time. You need to make sure you truly enjoy the great outdoors when traveling. And the way to do this is to plan out your journey so you can enjoy it safely, and you know where to go and what to do. There’s a lot of information on night time photography out there – but it usually talks about the camera! Let’s talk about what you’ll need to take with you if you’re shooting at night to keep yourself safe! I’ve made a short list of what I needed recently when taking a time-lapse of Pendennis Castle at night-time on the rocks. Of course, be careful where you’re shining it! In the first few frames of images, the castle was lit up from the light where I was looking for a place to sit as I waited! The lamp I have even comes with a remote control attached to the top – useful to leave on the rocks, and check from a safe distance if the tide was creeping dangerously closer to the camera! This may depend on where you’re shooting, what the conditions are, and how long you plan to stay out – but you should make sure you’re comfortable and warm – whether that means wearing a hat, or packing a fully loaded tent, that’s up to you! In my case, I knew I wasn’t staying out all night, but wanted to be warm and comfortable, so I bought along my trusty sleeping bag and self-inflating roll mat. Once I arrived on the rocks, I soon realised it was too steep and jagged to set up a roll mat. I didn’t want it to get pierced, so I left it rolled up. I also didn’t think I needed the sleeping bag. I started shooting around midnight and felt just fine, but when I was sat on the cold rocks for half an hour, the chill started getting to me and I was glad I bought it along. I unrolled it and found a place I could safely sit overlooking the camera’s shooting position but away from the ever-nearing tide! The roll mat made a good headrest too! Not for your camera, but for you! To get the images above, I prepared the camera and sat on the rocks monitoring it from midnight to almost 3am. I was so glad to have some hot food to keep me going, and to warm me up! All you need is a tin of beans (or any other food you feel like!) camping stove and something to cook it in, and you’re ready to go! I’ve got a neat little 6 piece stainless steel camping cook set that folds down really small, containing a frying pan, 2 saucepans with lids and another tiny little saucepan – the smallest one was fine for this night, but it’s nice to know you can probably cook a full breakfast in the morning if you’re shooting all night! Just make sure you either get a tin of food with the pull ring or a multi-tool to open it! And don’t forget cutlery like we did in Dartmoor! Just because you’re out in the wild all night, you may not be able to relax and enjoy nature as much as if you were on a camping trip! Make sure you have something to keep you occupied, as you’ll likely be sat around waiting a while! If you can get far away from your camera’s subject, you can use your light to read a book, or get some paperwork done! If you’re only out for one night, you’ll likely be able to rely on electronics to keep you busy, but don’t count on getting a mobile signal or charging batteries in the middle of a field, or out by the sea! As an avid video gamer, I took my trusty DS Lite for this trip and finished off my current game of Castlevania: Dawn of Sorrow. Just make sure the light from any electronics doesn’t mess with your shot! This time for your gear, not you! One of the problems with shooting at night is condensation – everything gets covered in it. 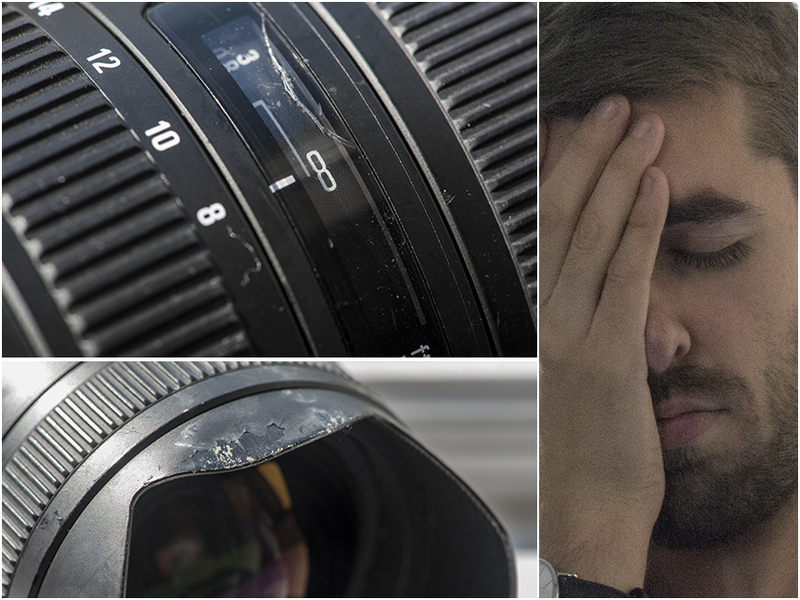 You can protect your lens with a handy dew heater, but what about everything else? A dry bag is a must to keep all your gear in! it’ll not only protect your camera equipment but also any sleeping gear, and make sure your cook equipment doesn’t get ruined! Mine is an awesome shade of orange, meaning I can see it no matter how dark it gets! I found that with the lamp inside I even have a nice bright orange light to lead my way! It can be folded down to any size you need and clips together with a very useful handle at the top. Very useful indeed. I’m tempted to use to to cover my camera one day – it’ll keep it protected and that window in the middle will allow me to shoot through it! As you can see in the image above, this is also from the Clas Ohlson Asaklitt range. Once you have your timelapse of images, you process it like the clip at the top of the post, or like the images below! Happy shooting! Have we missed anything? What would you take with you? Is there anything you’ve found useful in the past? Let us know in the comments below! There is something incredibly fulfilling about enjoying the great outdoors via an RV or motorhome! This is probably because it allows you the best of both worlds. You can access the places that you want, and have room to take the necessary equipment with you. However, you have a place to cook in the mornings, and shower in the evenings. These little conveniences mean that you can actually enjoy your time in nature, without feeling grubby or peckish! Whether you chose to travel by RV or not, be sure you sleep under the stars at least once during your time in the great outdoors. The sense of adventure will be magnificent, plus all of that fresh air will do wonders for your lungs! Just don’t forget your sleeping bag! If there is a certain activity that is very popular where you are headed try it out. The chances are that it is popular for a reason. Even if you’ve never fished before, try fishing for the first time if it’s a big deal where you’re headed. The same goes for all other outdoor activities too, be that surfing, canoeing, bouldering or something else. Join in and find out what all the fuss is about! We are such a connected world these days. Leaving the devices that allow us to stay in touch with everyone and everything behind can be touch. But a far more authentic and fulfilling experience will be waiting for you if you let these things be for a while. Chat with a friend you’ve met along the route, instead of telling your friend on Facebook all about it. Turn off the music on your iPod, and listen to the music of bird song instead. It might still be wise to take your phone with you, especially if you’re out in the wild, or deep in a park. Just keep it charged up, switched off and in the bottom of your bag; instead of glued to your hand! When out in nature, things may occur that you weren’t expecting. Imagine this; halfway through a hot and sweaty 10-mile hike, you’ll find a beautiful lake you didn’t expect to find. The water is a mesmerizing blue. Others are swimming in the lake enjoying the sunshine. If this happens, don’t let anything hold you back from getting involved. “I’m not wearing the right clothes!” and “I don’t want to get my hair wet” are excuses that just won’t cut it! Being spontaneous allows you to enjoy nature to its fullest- even it’s beautiful surprises!